The purpose of boys growth chart is to track the developmental milestones of an individual boy. From infant to child, adolescent and becoming an adult. 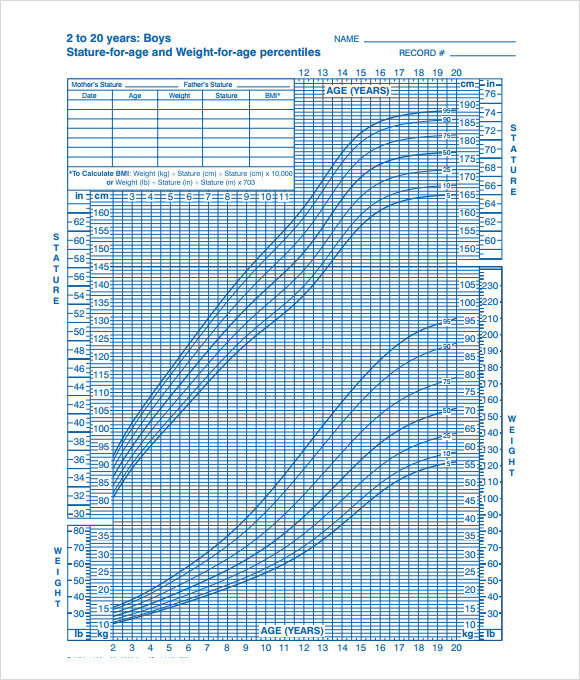 The boy growth chart is a tool used by the doctors to determine if the growth of the boy is appropriate to his present weight and age. With the help of these Chart Templates, it will be easy to understand the concept of a boy when talking to their growth and development. The examples for this growth chart found in the website online are downloadable in a format preference or make it in Microsoft word/excel. 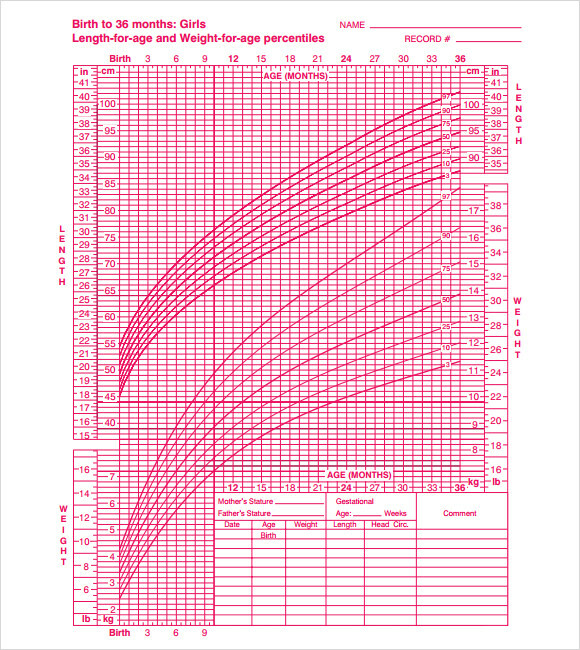 These are Sample Girls Growth Charts that allow any user to obtain for customization or used it as a guide especially for parents who monitor the development of their child boy by printing a sample of this chart. 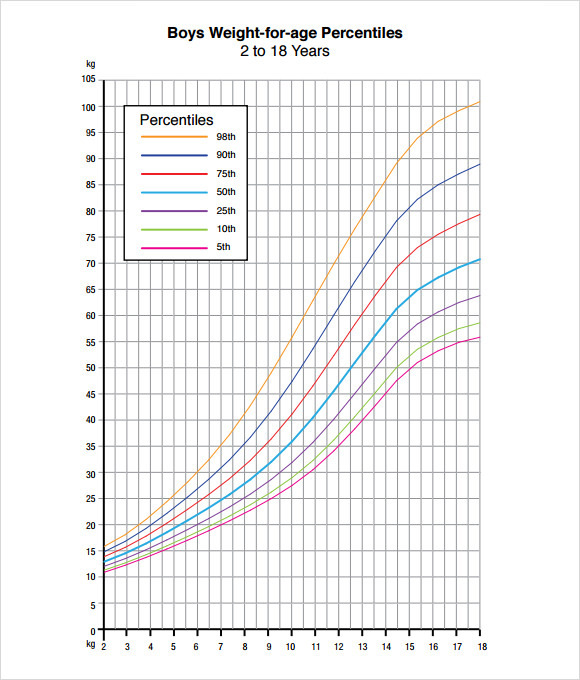 This sample of boy’s growth chart percentile is meant for measuring the growth of boys from 2- 18 years. This a very detailed chart where the name of the student, his date of birth along with his class and identification number is written. The various factors on which the growth of a child is measured include height velocity, head circumference, weight percentile and various stages of puberty. 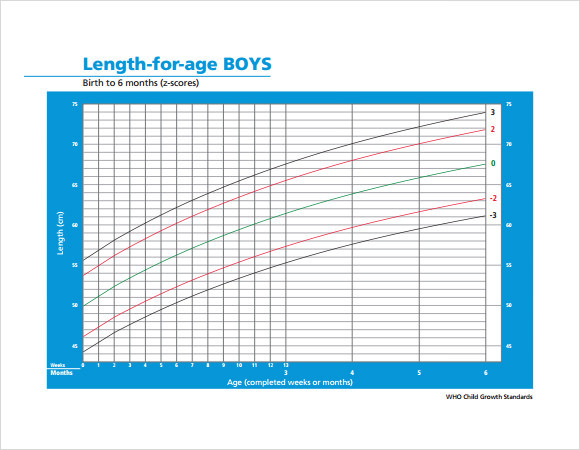 This sample of boy’s growth height predictor is designed on a white background with bright blue borders on all four sides. 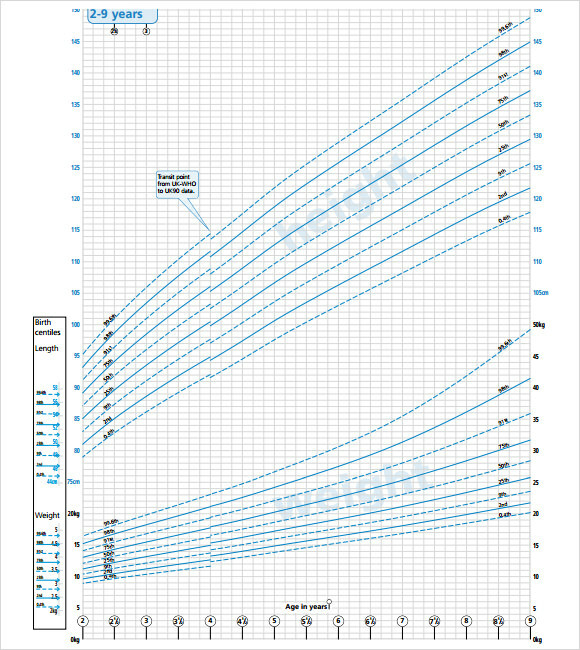 This chart is used to predict the growth of a child in between 6 months to 3 years. The horizontal column has the reading for the length while the vertical column is reserved for reading the age in months. The graph can be plotted with different colored lines to measure the growth. This template is yet another hart for measuring the height and weight of newly born infants. The horizontal column has the height measurement cms, while the vertical bar is reserved for writing down the weight variation. At the end of the chart the doctor or nurse can write down the findings in a structured format. 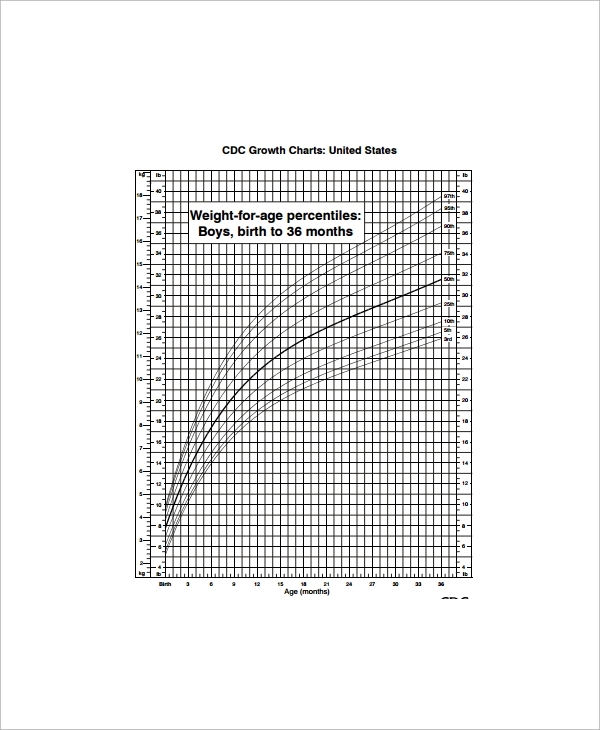 This sample of boy’s growth chart weight also uses a graphical presentation method to spot the growth in terms of weight and height. This chart is meant for slightly older boys in the age group of 2-20 years. The name of the child along with his guardian is written in a box on the right hand corner, followed by the age at the bottom the vertical bar and height and weight readings on the horizontal panel. How Can I get Copies of the Growth Charts? Growth charts play a very important role in keeping a tab on the height and ratio of a child which is important for his overall development. These charts are freely valuable on the internet. You can download a simple version from our website or contact any nearby medical facility to obtain this chart. 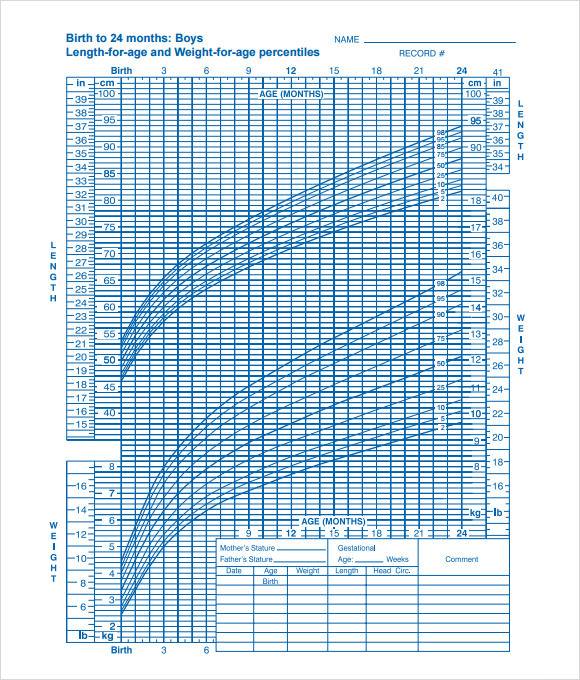 You may like Baby Growth Charts. How To Use Of Growth Charts For Assessing And Monitoring Growth? Growth monitoring is very important to ensure that the child is receiving his adequate nutrition and not devoid of any special food items. Health and program planning sections gets considerable data for planning, implementation and evaluation of a child’s overall growth. Heath charts nowadays also include a section dedicated to BMI, which gives a person a good idea about his ideal weight. During the first two and three years babies usually get on well with kids who play a good role in their mental development or overall progress. You can hang the growth chart on the door of the child, which would continuously encourage her to perform better. Within the phase of 12 years there will be lots of things to buy from. Take a day break and enjoy the beauty of your child’s growing up phase. You can also keep customized keep sakes, which would serve as a reminder of your days as a kid. A child’s growth depends upon a lot of factors. Proper nutrition, exercise and rest are very important to win in life. These guide templates are 100% customizable and very simple to interpret. They have an easy design and parents can plot the reading on a weekly basis using the charts. These charts can be directly downloaded from our site if required.